After Hitler, the policy of appeasing dictators – ridiculed by Winston Churchill as feeding a crocodile, hoping it will eat one last – appeared to be permanently discredited. Yet the policy has enjoyed some successes and remains a live temptation today in dealing with the Islamic Republic of Iran. Academics have long challenged the facile vilification of appeasement. Already in 1961, A.J.P. Taylor of Oxford justified Neville Chamberlain's efforts, while Christopher Layne of Texas A&M currently argues that Chamberlain "did the best that he could with the cards he was dealt." Daniel Treisman, a political scientist at UCLA, finds the common presumption against appeasement to be "far too strong," while his University of Florida colleague Ralph B.A. Dimuccio calls it "simplistic." 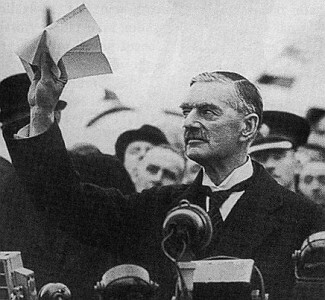 Neville Chamberlain mistakenly declared "peace in our time" on September 30, 1938. In perhaps the most convincing treatment of the pro-appeasement thesis, Paul M. Kennedy, a British historian teaching at Yale University, established that appeasement has a long and credible history. In his 1976 article, "The Tradition of Appeasement in British Foreign Policy, 1865-1939," Kennedy defined appeasement as a method of settling quarrels "by admitting and satisfying grievances through rational negotiation and compromise," thereby avoiding the horrors of warfare. It is, he noted, an optimistic approach, presuming humans to be reasonable and peaceful. Moral: After the Evangelical movement swept England in the early nineteenth century, British foreign policy contained a strong urge to settle disputes fairly and non-violently. Economic: As the world's leading trader, the United Kingdom had a vital national interest in avoiding disruptions to commerce, from which it would disproportionately suffer. Strategic: Britain's global empire meant it was over-extended (making it, in Joseph Chamberlain's term, a "weary titan"); accordingly, it had to choose its battles sparingly, making compromise an accepted and routine way of dealing with problems. Domestic: The extension of the franchise made public opinion a growing factor in decisionmaking, and the public did not care for wars, especially expensive ones. As a result, for over seven decades, London pursued, with rare exceptions, a foreign policy that was "pragmatic, conciliatory, and reasonable." Again and again, the authorities found that "the peaceful settlement of disputes was much more to Britain's advantage than recourse to war." In particular, appeasement steadily influenced British policy vis-à-vis the United States (in relation to, for example, the Panama Canal, Alaska's borders, Latin America as a U.S. sphere of influence) and Wilhelmine Germany (the "naval holiday" proposal, colonial concessions, restraint in relations with France). Kennedy judges the policy positively, as serviceably guiding the foreign relations of the world's most powerful state for decades and "encapsulating many of the finer aspects of the British political tradition." If not a brilliant success, appeasement permitted London to accommodate the expanding influence of its non-ideological rivals such as the United States and Imperial Germany, which generally could be counted on to accept concessions without becoming inflamed. It thus slowed the UK's gentle decline. Post-1917 and the Bolshevik Revolution, however, concessions failed to mollify the new kind of ideologically-driven enemy – Hitler in the 1930s, Brezhnev in the 1970s, Arafat and Kim Jong-Il in the 1990s, and now, Khamene'i and Ahmadinejad. These ideologues exploit concessions and deceitfully offer a quid pro quo that they do not intend to fulfill. Harboring aspirations to global hegemony, they cannot be appeased. Concessions to them truly amount to feeding the crocodile. However dysfunctional these days, appeasement abidingly appeals to the modern Western psyche, ineluctably arising when democratic states face aggressive ideological enemies. With reference to Iran, for example, George W. Bush may bravely have denounced "the false comfort of appeasement, which has been repeatedly discredited by history," but Middle East Quarterly editor Michael Rubin rightly discerns in the realities of U.S. policy that "now Bush is appeasing Iran." Summing up, the policy of appeasement goes back a century and a half, enjoyed some success, and ever remains alive. But with ideological enemies it must consciously be resisted, lest the tragic lessons of the 1930s, 1970s, and 1990s be ignored. And repeated. "Lebanon Turns into Israel's Vietnam." The Wall Street Journal, March 10, 1999. "Enough is enough" has replaced "Never again." "They had a name for it[: Appeasement]" (with Mimi Stillman). The Jerusalem Post, July 5, 2000. Giving Israeli policy its proper name. "Korean Delusions [of Appeasement]." New York Post, October 9, 2002. South Korea mimics Israel in appeasing its enemy. "[Appeasement and] Why Europe Balks." New York Post, January 28, 2003. World War II and the Cold War have disappeared down the memory hole. "Richard Clarke's Appeasement." DanielPipes.org, March 28, 2004. A counterterrorist specialist misunderstands the war on terror. "Appease Iran?" The Jerusalem Post, September 25, 2008. The "perfectly respectable" policy of appeasement is back in vogue.